This post is from a YouTube by Traditional Catholic Faith and Morals. It is biblically accurate and worth sharing. I took snippets out of it so it’s not the entire video. A stay at home mom is often viewed by career women as being a slave, a victim, and having no life. Many feminists view children as a nuisance, a hindrance to personal success; thus, many blinded women have chosen not to get married, not to bear children and not to guide the house. These ideas are evil. God never intended for women to pursue careers at the expense of motherhood. God intended for women to be keepers at home. God wants young women to be keepers at home – baking, cooking, sewing, doing laundry, teachers of her children, taking care of family business, and being a help meet to her husband anyway she can. That’s why God created the woman – to help her husband. 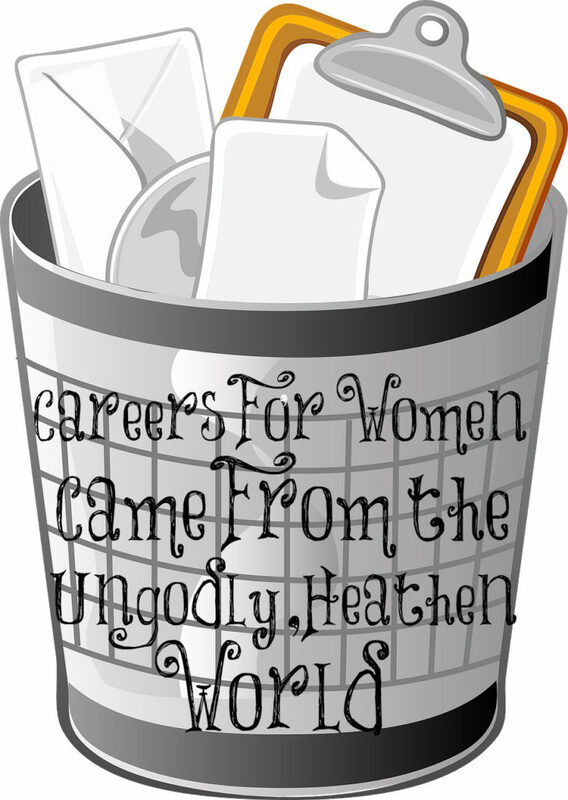 The idea of a woman having a career came from the ungodly, heathen world and not from the Scriptures. God never intended for women to be executives, cops, helicopter pilots, lawyers, realtors, soldiers, etc. Modern apostate society treats women just like men, as a consequence, women now act like men. Many people see no harm in women pursuing professional careers, but when it comes down to reality these types of women act and think like men. They are decisive, strong-willed, tough, loud mouthed, demanding, dominant and lack the biblical traits God desires in a Christian woman. A career woman is very far from what God intended for her to be. Feminism is a “social movement” that demands it all. It makes us like men. It makes us infertile, frustrated, unhappy, and empty inside. There is no true happiness in feminism. It is against our own nature! Women will only find true freedom when they believe in Christ and submit their lives to God’s holy law. Good or Brawling Wife? It’s Your Choice. I agree with this. It took me awhile to not see myself as a “low achiever” once I became a mother and chose to stay home with our baby. Even though that is how I saw myself for awhile, I loved that baby so much that I didn’t care about being a “low achiever”. A few months in, I realized if I had been the president of a multimillion dollar company, I would have quit to not miss my baby’s childhood. It was that amazing to be a wife and mother. Now they are 27 and 29 and I am praying almost hourly it seems like that they can find a Godly wife. I never imagined that finding one would be this hard. They are scarce. Thank you so much for posting this, Lori! I am a Catholic and oh, how I wish that all of our priests were on board with this teaching. I did email Msgr. Stuart Swetland from Relevant Radio last week about this very issue…when on his program “Go Ask Your Father” he had indicated that society in the 1950s suffered from sexism and discrimination against women in the workforce. To my surprise, he read my email on his July 14th podcast and responded that Catholic teaching on social justice does not forbid women in the workforce, and that women in the Bible such as Naomi and Ruth were industrious, working women. By the way, Msgr. Swetland is a convert to the Catholic Faith, he was raised Protestant. If you ever have time, I would love for you to listen to that July 14th show and relay your thoughts. I stand by my position that women need to be keepers at home, and I wish with all my heart that ALL churches could embrace this teaching. I completely agree. It really annoys me that the Church generally and at a local level individual Priest, are to afraid of the feminist lobby and of alienating morally liberal congregations to speak Biblical truths about the role and responsibilities of women at every level. They are afraid to criticise immodest and unfeminine dress, to emphasis motherhood over career, or even to take a definitive line in condemning birth control. I am continually impressed with your determination to speak unpopular truths, despite the pushback. Bravo! Keep it up! That post was from a Catholic site, you said? Hmmm, interesting. I’m not a Catholic, and don’t believe women should be having careers at the expense of their families. Working part-time out of necessity is one thing, but choosing to have a career and putting babies and young children into childcare and neglecting homes and husbands, is entirely another. But my daughter goes to a Catholic school and the Catholic principal – a woman – is married with children. This is a very demanding job, and this woman is very good at it – she puts so much of herself into the role, even travelling for two months to a foreign country on an exchange of some sort, leaving her husband and children behind. So it seems somewhat hypocritical to me (someone who knows very little about the Catholic faith) for Catholics to be preaching this, but doing something else entirely. KAK, I think this is a mindset in the majority…people don’t want to offend women by suggesting they focus on only being a wife and a mother, so they do what they can to accommodate them. The Catholic Church and the Protestant churches alike are often accused of being misogynistic so they acquiesce to what society demands. If the threat of defunding organizations like Planned Parenthood has caused a major national uproar, you can see why they are reluctant to teach the truth. It is very sad. Speaking as a fellow Catholic wife and SAHM -I very much support the Church taking a much clearer, more traditional and more Biblical approach. I am a very happy stay at home mother and wife and very happy to be able to do so. As I was a nurse on my way home from a double shift one night and was in a horrible car accident as I fell asleep and struck a telephone pole. I had suffered some injuries and landed in the trauma unit. To this day I have been a stay at home wife and mother. I love and enjoy making them happy. I would never change a thing. It was the Lord God’s way. Thank you so much for posting and sharing this. We need to see God’s Word and listen to it more often. I’m just grateful that my husband has been blessed with an outstanding business that allows me and everyone here be comfortable because of God’s blessings. Love you know who. Sometimes one has no choice but to work to make ends meet.It would be wonderful that all mothers could stay home, but not everyone can afford that luxury .